To make room in the Cryostat Workshop for the assembly of the upper cylinder, contractors are preparing the completed lower cylinder for storage outside on the platform. The process involves reams of synthetic "cocooning" material and sprayable glue. The "mothballing" technique for the lower cylinder is designed and implemented by Cocoon Holland, a specialist in weatherproof storage solutions. Mid-April, the mega-doors of the Cryostat Workshop will open to allow the lower cylinder to be removed on a self-propelled modular transporter. 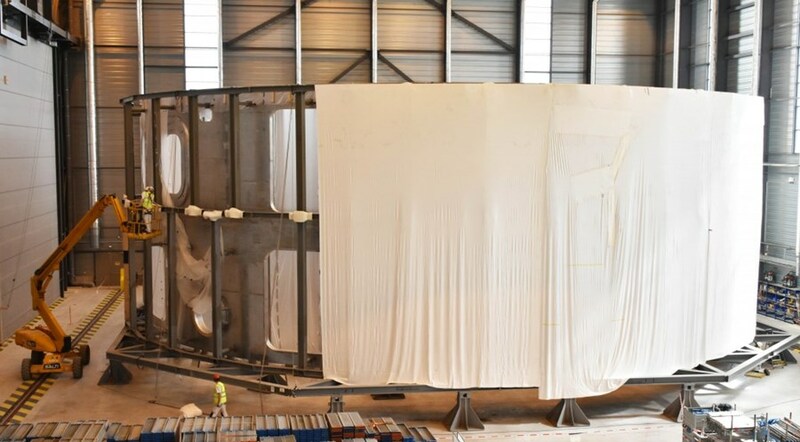 The 490-tonne component will be dressed all in white for the occasion, wrapped in layers of synthetic thermoplastic material that are "melted" together through the application of sprayable glue. The synthetic skin that is formed seals the lower cylinder hermetically and protects it from weather, moisture and dust. Inside of the cocoon, the enclosed air is kept constantly circulating and humidity is maintained at a steady 38 percent—conditions that prevent the formation of corrosion or mould. The component will travel only a few dozen metres to a storage zone to the north of the Workshop. The transport path has been reinforced with airport-grade paving materials that can withstand pressures of up to 20 tonnes per cubic metre and large turning loads.